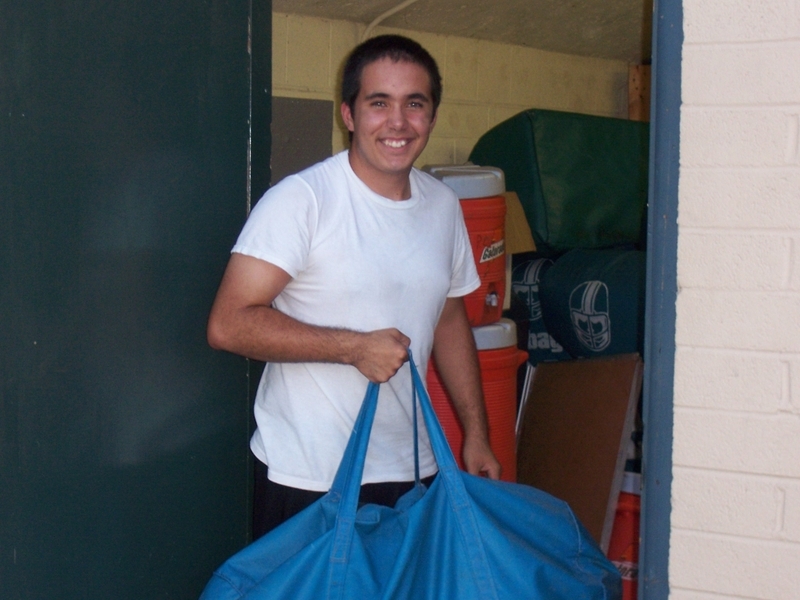 This is Michael putting away a huge nylon bag full of NFL-quality footballs. These get locked up in the equipment room after practices and games. Phoenix Christian played their first regular season game last night. They won - it was definitely an ugly win. They were losing the game until 3 minutes before the end of the game. Then they had a spectacular run for a score. Then the defense held the other team back from scoring. Then we had the ball with less than a minute on the clock. Then we started playing the game by micro-milli-seconds. Throw in a few timeouts from us and the other team. Then we finally punted the ball on 4th down with 7 seconds to go. The ball sailed high into the air then the clock ran out before it hit the ground. I could hardly watch. But we did it. Success & victory came at last. We sat in the front row, near the middle of the bleachers. I watched Michael out of the corner of my eye the entire time. He was always in motion, filling the water bottles, offering them to players, taking them out on the field when there was a time-out. He must have walked five miles by the end of the 2 hr game. He said he had fun. I'm really glad. It had to be at least 100 degrees in the stands. But it was fun to cheer on a team. Mike's team. Our team! 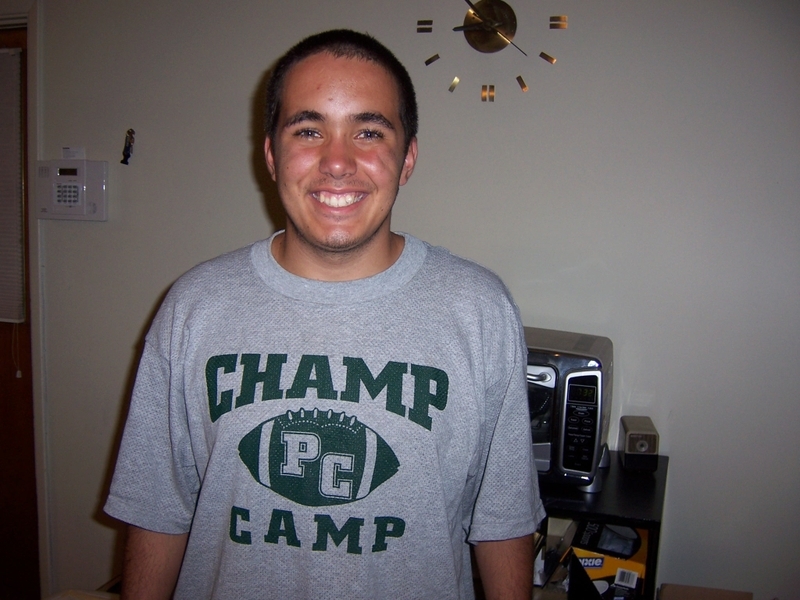 Michael just returned from Champ Camp tonight...minus his hair. I guess the Seniors on the team get to shave the heads of all the lower classmen on the team at camp. Mike looks pretty good with short hair. It will certainly be a lot cooler with less hair on his head. And it will grow back fast. It always does. Michael said that camp was fun but really difficult at times. They hiked up and down a whole mountain today. They had to build their own tents from tarps and ropes. The had no running water. I'm thinking his toothbrush was never unpacked. 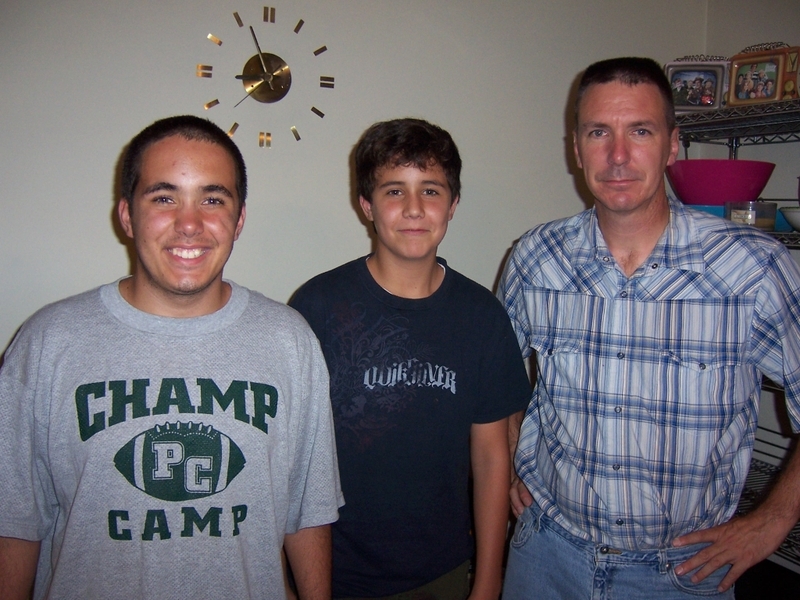 And just as a bonus, here's a picture of my three favorite men...can you pick out the one who needs a haircut? Can you find the one who has a Russian barber who went crazy with the clippers one day last week? Click on the pictures for a clearer, bigger picture! !